Contrary to normal blog rules, this one is long as there is so much to tell. First: What is “Black Mountain Songs”? 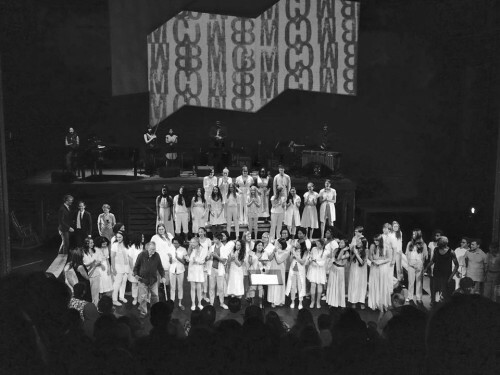 A collaborative musical event, inspired by the spirit of Black Mountain College, with songs composed by Jherek Bischoff, Bryce Dessner, Tim Hecker, John King, Nico Muhly, Richard Reed Parry, Caroline Shaw, and Alexsandra Vrebalov, arranged in a seamless stream for the voices of the Brooklyn Youth Chorus. The show offered projections of archival and new visuals; two dancers, old Gus Solomons, once a member of the Merce Cunningham company, and young Adam Gauzza most recently of the Caroline Dorfman company; and seated stage left, Basil King, painter, poet, and Black Mountain College alum, as narrator, reading bits of poetry and prose by Fielding Dawson, Josef Albers, and himself. 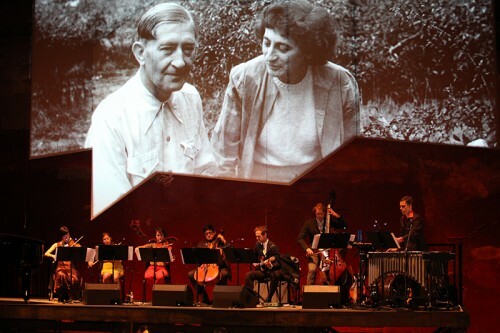 On the BAM stage: film projections, the chorus, musicians, and narrator, with Dianne Berkun-Menaker, conducting. Photo for Brooklyn Youth Chorus by Julieta Cervantes. 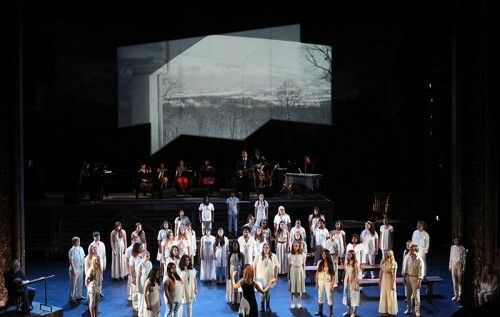 The four performances of “Black Mountain Songs” went flawlessly to full houses and enthusiastic audiences at the Harvey Theater—part of the annual Next Wave Festival at BAM. In fact every performance seemed richer and more exciting than the last. (This despite Basil battling a vicious upper respiratory infection which emerged as full-scale bronchitis once the shows were over.) 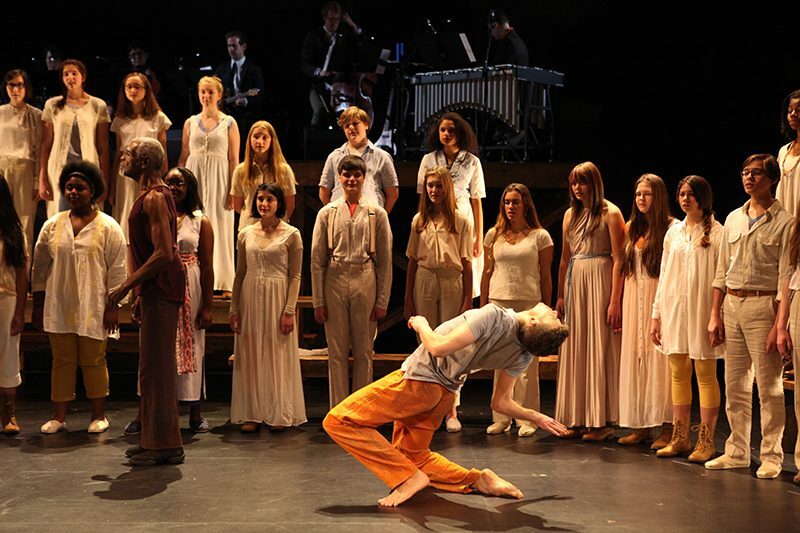 Multimedia in elegant restraint: the amazing kids of the Brooklyn Youth Chorus singing without scores and moving to choreography that balanced their singing. Here are links and reviews. Some background Bryce Desser (composer and lead guitar in the indie-rock band The National) found Black Mountain first via composers—John Cage and Lou Harrison particularly. And he’d been in those mountains as a boy when his parents sent him to a summer camp not far from Black Mountain’s former campus. Later, Bryce’s sister, who was studying poetry with Larry Fagin and at the New School, began bringing him books he’d never encountered in a straight education: Charles Olson. Robert Duncan. Robert Creeley. And there was more. The models of democracy and cross discipline collaboration Black Mountain presented spoke to him. Bryce shared his enthusiasm with friend, collaborator, and fellow composer Richard Reed Parry (instrumentals and vocals for the indie-rock band Arcade Fire). Both musicians move easily from art rock to composing and performing contemporary concert music. Bryce’s previous collaboration with the Kronos Quartet and the Brooklyn Youth Chorus set his ideas rolling. Basil accepts applause from chorus and audience. Oh, Black Mountain, wonderful place, desperate place. I was blown to where light abstracts the smallest thing, into the core of a vernacular, into the heart of the abstract. No wind but the stillness blows me, no reason; no existence blows the shapes that have lost their edges. Oh, Black Mountain, wonderful place, desperate place. Blow your feathers and your worms. Your mulch protrudes the surface. Your bravery blows forgiveness. Your anger blows freedom. Oh, Black Mountain, wonderful place, desperate place. I was blown to where light abstracts the smallest thing, into the core of a vernacular, into the heart of the abstract. No wind but the stillness blows me, no reason; no existence blows the shapes that have lost their edges. The Youth Chorus responded with hope for their Black Mountain and a marvelous final song, “Their Passing in Time,” words and music by Richard Reed Parry. Will there be more? Possibly. Visit Bryce Dessner’s website for news and updates. Posted on December 10, 2014 by Martha King. This entry was posted in ART, Basil King, Martha King, Poetry, Prose, Readings, Writing and tagged Ani Albers, BAM Next Wave, Basil King, Black Mountain College, Brooklyn Youth Chorus, Bryce Dessner, Charles Olson, Fielding Dawson, Josef Albers, Learning to Draw/A History, Richard Reed Parry. Bookmark the permalink. Terrific post Martha, thank you — and so lovely to end it with Baz’s invocation. Looking forward to seeing this poetry treasure since I know I’ve missed the extravaganza, unless … & it will all have to wait ’til I get up to NY. Your round up really covers the event terrifically. Thank you for the text of some of Basil’s narration. As a co-organizer of the Friends of Basil King, hearing the voices of the Kings ring out and amplified and yet very much themselves–no theatricalized exaggeration — and seeing the sharp, moody blk and white photo graphics on stage, was really a thrill. I got goose bumps! There is so many rich BM stories to tell and so much to bring forward. As is true of another site of activity and ferment, The Poetry Project at St.Mark’s Church, there are multiple slices or lateral slides that could be taken of these places…The production was a brave and unique conjuration of a place and an abstraction! The voicing’s of the poems were fantastic and offer so much potential. Congratulations, Basil and Martha.